When you are born with red hair, fair skin, and blue eyes, it’s a given that summer in the sun will be spent covered up. 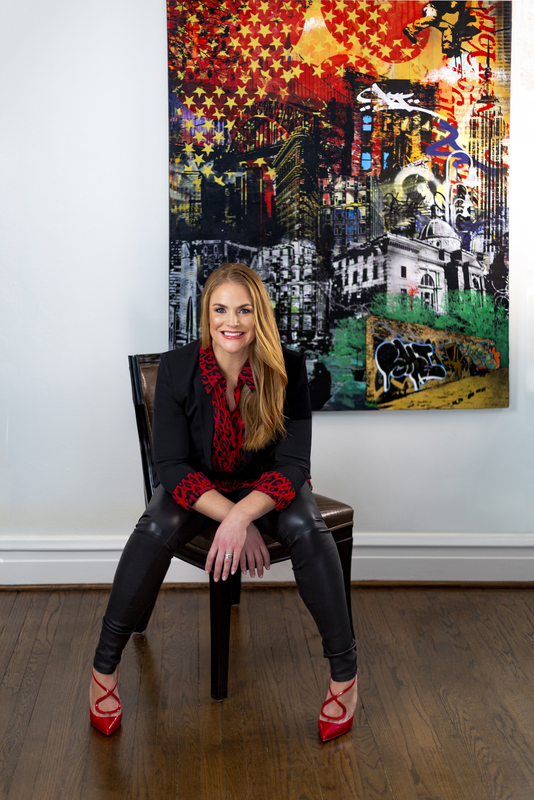 Sticky sunscreens, long sleeve shirts, hats, and bulky wraps were all part of her childhood territory, says Anne Reilly, CEO of Mott50, the style-forward swim and activewear company she co-founded in 2011. “I knew there had to be a better, more fun, and stylish way,” says Reilly, chatting in her Kenilworth home between designer talks, and collecting children from school. Mott50’s fresh, fun apparel makes “stylish” and “sun-protected” synonymous. The next week, Mott50 was born. And with that, “stylishly fun ” and “sun-protected” became synonymous. With the tagline “Chase the sun!” Mott50 has blossomed into a leading maker of colorful, bold, sun-protective apparel for swim, surf, sport, and play. Even better—collaborations with top designers mean new collections keep the line fresh with a high-fashion cache. Mott50’s Margherita collection, launched October 2018, features core pieces interpreted through the eyes of renowned Italian designer Margherita Maccapani Missoni. Missoni’s signature color blocks—purple/magenta/green, peach/magenta/jade, and lavender/yellow/peach—give customers Mott50 swimwear in exciting, new palates. Also fun? Jewelry prototypes from artist Lisa Coolidge Roberts that models wore during the shoot, led to another collaboration: Robert’s Glo jewelry is now sold on Mott50’s website. Reilly’s playful designs and creative collaborations with Missoni, Roberts, and others, have resulted in celebrity endorsements, placements in leading fashion magazines, and booming sales. Whimsical avocado fabric designed by Gretta Kruesi, an artist who painted wildlife panels in Reilly’s home, became a line of swimsuits and yoga pants for Mott50 that model Chrissy Teigen fell in love with and wore with her baby, Luna Simone, in a photo for her newest cookbook, Cravings 2, the long-awaited follow-up to her 2016 release, Cravings: Recipes for All The Food You Want to Eat. Initially launched with a simple assortment of practical clothing, Mott50 expanded to include a key selection of “Never-Outs”—long-sleeved t-shirts, short-sleeved t-shirts, cover-ups, and pants, plus a robust swim assortment. And new this summer? Mott50 is introducing its first ever menswear collection, plus tennis and golf wear. The menswear collection will include three versions of a boxer-type swimsuit, plus a Rash Guard for the beach. The tennis and golf wear collection will include a tennis dress, golf and tennis skirt and a variety of mix-and-match shirts. All Mott50 clothing is UPF50—the highest certification offered by the American Association of Textile Chemists and Colorists, blocking 98 percent of UV radiation from reaching the skin. “This means it blocks both harmful UVA (which cause aging) and UVB (which cause burning) rays,” says Reilly, adding that the swim collection is also quick drying and anti-microbial. Selling Mott50 clothing has been an ongoing evolution. Items are available in more than 250 boutiques, country clubs, and stores—including Nordstrom. Plus, Reilly has done pop-up stores in key markets during peak seasons—Los Angeles and New York in 2015, Plaza Del Lago here on the North Shore in 2016, Nantucket and the Hamptons last summer, and right now? Palm Beach. She has explored the idea of doing a brick-and-mortar location but still believes that online sales have the most potential. “Our online sales have tripled since 2016,” she says. And while the split between sales in stores and e-commerce used to be 60 percent stores versus 40 percent e-commerce, that completely flipped in 2018. Contributing to this, Reilly overhauled and redesigned the company’s website in 2017 which yielded strong results. But Reilly gives even more credit to a never-yielding focus on fun. Keeping designs fresh through continued new partnerships is also key. While she can’t yet reveal who they are, Mott50 partnerships with two more designers will launch this May and June. Mott50 has also partnered with online children’s boutique Maisonette, to sell kids swimwear in whimsical new unicorn beach party, avocado, and other prints. New Mott50 collections are released three times each year. The Resort Collection in October, Spring Collection in March, and Summer Collection, late May. For more information, visit Mott50.com.